Play started with the characters being established as freelancers working for a timber company called Outland Lumber Co. Description and a little of the backstory of each character was then shared as well as their starting location of the company town of Bowerstead Post. They were called into the office of the town's foreman and told that they were being given a job to deliver supplies to a logging camp located near a twin pair of hills known as Taran's Bluffs. The list of items was food, medicine, new tools and some mail for the loggers based at the camp. They were also approached by a man, Ardan Gowan, who asked the characters to deliver a small package to a workman called Tolbert. Jack refuses to take the package until Ardan reveals what it is, in the end Ardan reluctantly opens the package to show that it is a small wooden box containing peppermints. Alex decided to do a search based Notice to make sure nothing was hidden in the box, a high roll turned up nothing but the peppermints. 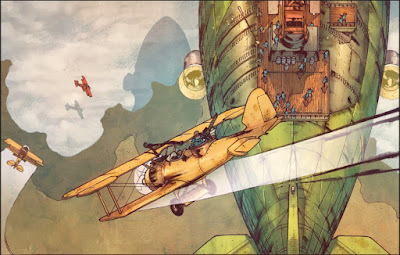 The specks soon turned out to be medium fighters aiming to intercept the character's airship. Jack took the airship's controls whilst the others fought among themselves over who was manning what turrets, ultimately George took the front turret, Alex the rear turret and Herbert manning the turret of the Marauder still attached underneath the belly of the airship. Jack threw the airship into a tight bank round, swinging the airship round almost 180 degrees. George fired off a burst from the twin 50-cal MGs in his turret and scored two hits on one of the fighter, though only one did enough damage to inflict a wound. The fighter's pilot failed both their Out of Control and Bail Out rolls, something that would set the standard of my dice rolling for the evening. Herbert and Alex fired off bursts from their respective turrets, though only Alex scored a hit but failed to do anything more and the pilot just managed to stay in control. One of the fighters tried shooting the airship's engines but missed (will explain at the end), the other managed to do a Jink manoeuvre to improve its Evasion (thus stopped Herbert from doing much against it) but failed to do much with its shooting. Next round saw Jack throw the airship into a tight turn, causing the two fighters to overshoot. One of the fighters tried doing an Immelmann turn to bring itself back around and failed miserably, but managed to stay in control (as well as burning through all my GM bennies). The other elected to try a much more sedate turn. Both fighters ended up falling victim to a burst of fire from the turret Herbert was manning, both pilots failed to bail out (one completely failed on a 1). Once again it was just the airship and the open sky. At Jack's insistence, the characters went to investigate and then salvage what they could from the fighters they had shot down. Upon finding the crash site for two of the planes the characters discovered that the planes were Kestral medium fighters, both had a picture of a white wolf's head on the fuselage. The pilot of the first wrecked plane they came across was death from a broken neck, though he wore a pilot's jacket with the same white wolf picture on the back and a necklace of wolf teeth. Jack and Alex checked out one of the other crashed fighters, finding the pilot still alive, trapped and firing potshots at them with a revolver. Jack managed to duck into cover behind a handy tree whilst Alex ran over, rested the end of his cane gun on the edge of the cockpit and pulled the trigger. Needless to say, the pilot wasn't able to make much of a response after that. Regardless, the characters salvaged the guns and ammo from both crashed fighters whilst noting the location of the third. Jack helped himself to a jacket from one of the dead pilots, noting the white wolf picture. The group as a whole didn't seem to be too fussed that they'd been attacked by sky pirates, then again they had shot the planes down with ease. Regardless, they re-boarded their airship and Jack bolted two of the salvaged machine guns to either side of the airship. They then continued back on track to the logging camp at Taran's Bluffs. Arriving at the logging camp they found it under a state of siege, barricades set up all around it as well as stockades. They were greeted by the camp foreman. Mosley, who explained that the camp had recently started suffering attacks from the local Windryder tribe. He went to explain that it was unusual and shortly before the attacks started, a group of men came through the camp in a hurry. Mosley asked whether the characters could help and Jack offered to trade Mosley one of the salvaged machine guns with some ammo, eventually managed to barter it for a key and some bottles of whiskey. Alex went and tracked down Tolbert to give him the peppermints they'd been asked to deliver, receiving Tolbert's thanks and an explanation that the mints was one of the few 'luxuries' he could get out in the wilderness. Herbert went to see whether he could lend any assistance to the camp's doctor whilst Sebastion and George ended up unloading the supplies from the airship. Once the airship had been unloaded, and despite Mosley's plea for help, Jack decided that the group should head back to Bowerstead Post now their 'job' had been completed. Jack argued that Mosley wasn't 'their' boss and so he could only ask them to help, additionally Jack wanted to get paid. So they departed Taran's Bluffs, leaving a fair number of disappointed people behind them. For the air combat segment I allowed the players to have an Evasion stat on the airship, Jack's high Piloting skill of d10 meant that the sky pirates struggled to hit the airship (though my bad dice rolling was a big factor as well). Going forwards any and all airships are going to have a TN of 4 like normal Shooting attacks, but I'm otherwise happy with how the air combat went. Additionally, its looking like some sort of incentive/orders from the boss is going to be needed to get the characters to go on certain adventures. Jack's player is playing the character as being bit of a douche, I just need to be aware of this for the rest of the campaign. Though Jack's player is looking to make more modifications to the airship, some of which I may be able to incorporate into future Frozen Skies related material. The sky pirates with the white wolf symbol has given a potential plot hook to use later on, though remains to be seen how they handle future 'jobs' from Ardan Gowan.